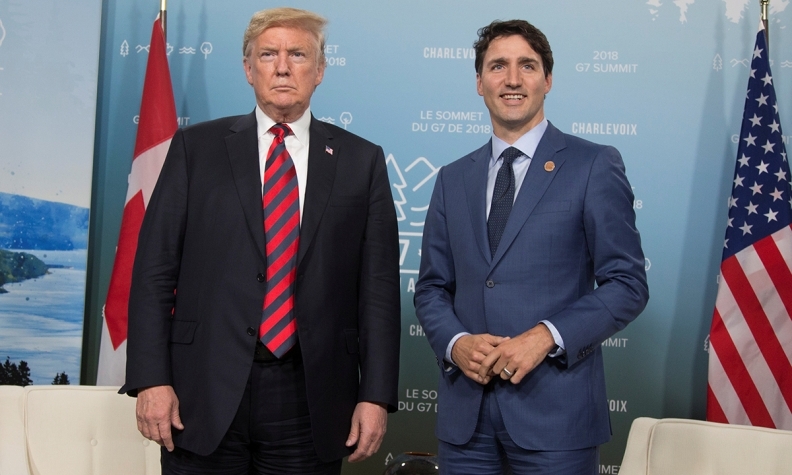 The bombast of Donald Tump, left, and Justin Trudeau contrasted with the insistence of negotiators that the mood inside the room was constructive as talks hit what is being described as an intense phase. WASHINGTON — Donald Trump and Justin Trudeau raised their trade brinkmanship to a new level Wednesday with each saying they were willing to walk away from the North American Free Trade Agreement if they don't get what they want. Trudeau started the day by branding Trump a rule breaker to argue in favour of keeping a mechanism to resolve trade disputes, while Trump hours later said Canada had more to lose than the United States if the two countries can't make a deal to preserve the three country NAFTA. "That's going to be fine for our country," Trump said. "It won't be fine for Canada." The bombast of the two leaders contrasted with the insistence of negotiators that the mood inside the room was constructive as talks hit what is being described as an intense phase. Foreign Affairs Minister Chrystia Freeland went out of her way to praise her counterpart, U.S. trade czar Robert Lighthizer, saying he was acting with "good faith" and "good will." "The atmosphere continues to be productive and constructive," she said Wednesday evening, adding that both countries' officials would continue negotiating late into the night. "We are making good progress. We continue to get a deeper and deeper understanding of the concerns on both sides." Negotiations, now in their 13th month, are key to determining the economic and trade relationship among the three North American countries, with many workers' and industries' prospects hanging in the balance. At the same time, Trump needs a win on trade ahead of the U.S. midterm elections in November that will test the president's ability to keep control of Congress. "We're not going to accept that we should have to sign a bad deal just because the president wants that," Trudeau told Edmonton radio station CHED. Trudeau offered some of his sharpest criticism of the unpredictable American president, saying that Canada won't give an inch to Trump's desire to scrap NAFTA's Chapter 19 dispute resolution panels. The chapter allows companies to have their differences settled by independent arbiters — something Trump views as an infringement of U.S. sovereignty. "We need to keep the Chapter 19 dispute resolution because that ensures that the rules are actually followed. And we know we have a president who doesn't always follow the rules as they're laid out," Trudeau said. Freeland, when asked about the comments, said she didn't want to negotiate in public, but added: "I agree with the prime minister in public all of the time, and in private 99.99 per cent of the time ... He made some important comments." "I think we've come a long way toward them treating us fairly," Trump said. But other issues have yet to be worked out, including Canada's cultural exemption in NAFTA. Sources familiar with the Canadian bargaining position say the cultural exemption Canada has insisted on preserving since NAFTA talks reopened remains an 11th-hour sticking point. Part of the disagreement on culture revolves around Canada's decision to allow the broadcast of glitzy American Super Bowl commercials, a decision that irks Lighthizer. His annual report on barriers to U.S. trade this year singled out the Canadian Radio-television and Telecommunications Commission's decision in 2015 to ban the long-time practice of Canadian advertisers inserting their ads into the Super Bowl broadcast over the more popular American ones. American networks worried that the CRTC's decision reduced the value of Canadian programming because the amount they pay for Super Bowl rights is determined by how much advertising they can sell in Canada, Lighthizer's report said. Lighthizer also said American broadcasters operating in border states have complained about Canadian counterparts picking up the U.S. signals and redistributing in Canada without consent. "The United States is exploring avenues to address these concerns," Lighthizer wrote. The goal of this week's talks is to reach a deal by Dec. 1 so Congress can give its approval to a revised three-country NAFTA before Mexico's new president takes office. Freeland wouldn't guess how much more time negotiators will need to come to some agreement. She compared the trade negotiation to the advice a midwife gave her on giving birth: "You never knew for sure how many contractions it would take to give birth to your child but you knew that each contraction was one contraction closer to the end. "I think that's where we are."